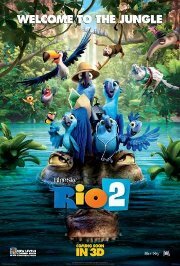 Blu, Jewel and their three kids live the perfect domesticated life in the magical city of Rio de Janeiro. When Jewel decides the kids need to learn to live like real birds, she insists the family venture into the Amazon jungle. As Blu tries to fit in with his new neighbours, he worries he may lose Jewel and the kids to the call of the wild. This film is releasing in both 2D and 3D, this is the 3D version. Comments The film contains themes that are mature and entertaining. The themes impact is mild and this can be enjoyed by the whole family.